Note: Includes only announced projects. Some high-risk projects excluded based on feasibility questions. Between 2014 and 2018, U.S. petrochemical capacity expansion projects are projected to increase domestic demand for ethane by nearly 600,000 barrels per day (bbl/d) and propane by nearly 200,000 bbl/d. This growing demand is in response to growing domestic hydrocarbon gas liquids (HGL) supply and favorable petrochemical feedstock prices in the United States relative to the international market. The petrochemical industry uses hydrocarbon feedstocks such as ethane and propane to create plastics, fibers, resins, and a wide range of other consumer and industrial materials. Ethylene-cracking plants most commonly process either ethane or naphtha to produce ethylene, an important compound used in the manufacture of plastics and other industrial materials. Although naphtha, a hydrocarbon that contains mostly molecules with 5–12 carbon atoms, is one of the lighter components produced by refining crude oil, it is a much heavier feedstock than ethane or propane, which respectively consist of hydrocarbon molecules with 2 or 3 carbon atoms. All ethylene projects currently planned for the United States are designed to consume light feed, predominantly ethane, for the production of ethylene. Most announcements of capacity expansions, feedstock changes, or new plant construction were made between early 2011 and mid-2013, when strong growth in natural gas production from shale provided the United States with a significant increase in the availability of ethane. Decreasing ethane prices during this period increased the cracking spread (the margin received from processing ethane into ethylene), spurring the rise in new investment. 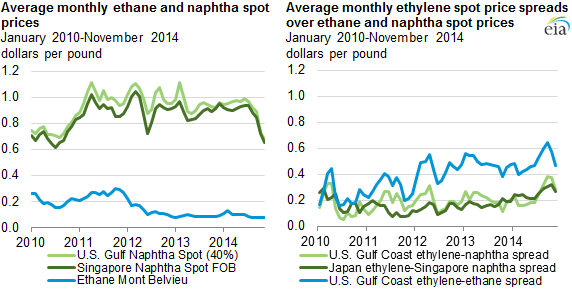 More recently, ethylene-naphtha cracking spreads have also risen in response to decreased naphtha prices. The recent rise in U.S. natural gas production has also increased the supply of propane, which in turn decreased U.S. propane prices and increased propylene-propane price spreads in the United States. As with ethylene cracking, this has led to plans to increase the capacity for processing propane into propylene at propane dehydrogenation (PDH) plants. Note: Cracking spreads account for co-product credit based on historical averages. 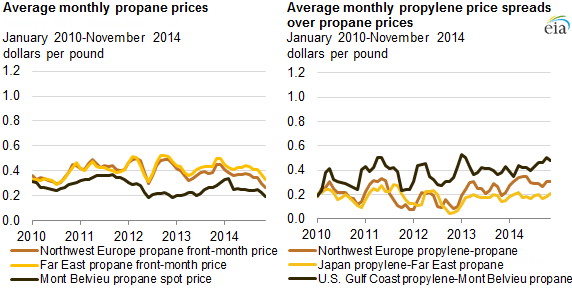 Note: Northwest Europe reflects a weighted average of spot prices from the Amsterdam-Rotterdam-Antwerp region. Far East reflects a weighted average of spot prices in several countries, including Japan, South Korea, and China. Ethylene crackers are expensive and complex projects that take many years to develop. Most of the ethylene cracker projects currently being developed will not come online until 2017 or 2018, including six large-scale projects announced in 2011 and 2012. Four projects (from Dow, ExxonMobil, Chevron Philips, and OxyChem/Mexichem) are already under construction, and two projects (from Formosa and Sasol) have received permitting approval and commitments from investors. Together with capacity expansions at existing facilities, these six new facilities are expected to increase U.S. ethylene production by 40%, to a total of more than 37 million metric tons (mt), more than one-fifth of current global ethylene production capacity (approximately 150 million mt). 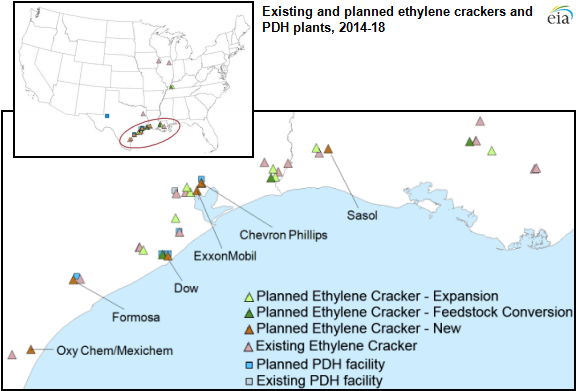 Currently, only one PDH plant is in operation in the United States: the PetroLogistics plant in Houston, Texas. This plant is estimated to consume 30,000 bbl/d of propane. However, there are six new PDH projects at various stages of development that, if completed, could increase U.S. petrochemical sector propane demand by an additional 190,000 bbl/d by the end of 2018.